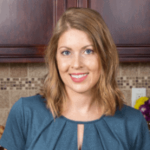 Published: Sep 24, 2015 · Modified: Feb 28, 2019 · By Jen Sobjack · This post may contain affiliate links. 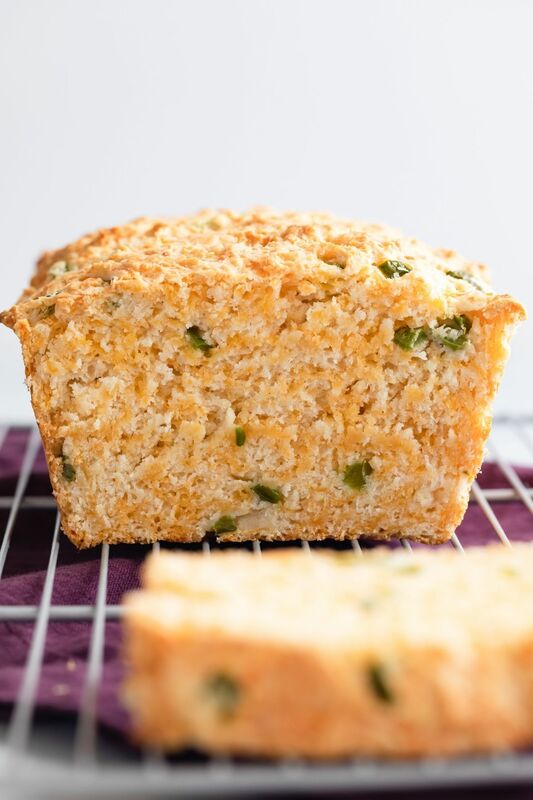 Cheddar Jalapeno Buttermilk Bread is super moist buttermilk bread loaded with cheddar and jalapeno. Buttermilk gives the bread a wonderful texture and delightful flavor. 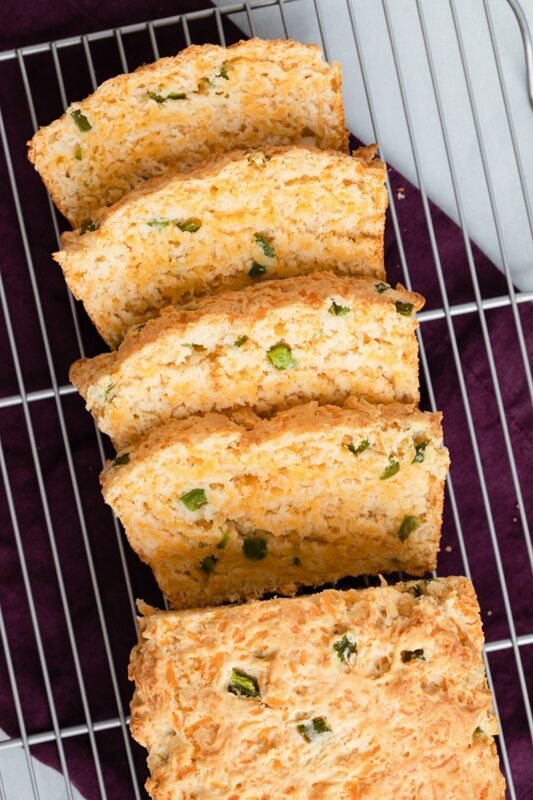 With a generous amount of sharp cheddar cheese and jalapenos, this bread will knock your socks off! It’s so flavorful and will be great alongside your favorite soups. This bread is quick and can be on the table in less than an hour. It’s as simple as dumping the ingredients into a bowl and stirring. It’s light, soft, crumbly, and full of cheese. I mean packed full! Homemade buttermilk bread is a great way to use up any leftover buttermilk you have hanging around in the refrigerator. Buttermilk bread is so delightful. The acidity of the buttermilk tenderizes and moistens the bread so you can cut back on butter and oil. This recipe uses only 4 tablespoons of butter. It also adds a slight tanginess which pairs wonderfully with sharp cheddar cheese and jalapenos. Today’s bread is rich with flavor and is great served alone or as a side to your favorite soup. I like to gobble down huge slices for breakfast when I’m feeling dangerous. As most of you may remember, I’m not much of a fan of heavy breakfasts. But once in a while, I like to live on the wild side. No yeast is needed for this recipe. This is a basic quick bread. Which basically means you mix it all up in one bowl, pour the batter into a loaf pan, and bake for 45 minutes. I believe the hardest part about this recipe is the aroma of the cheesy bread baking. It made my entire house smell amazing. Super moist buttermilk bread loaded with cheddar and jalapeno. Buttermilk gives the bread a wonderful texture and delightful flavor. 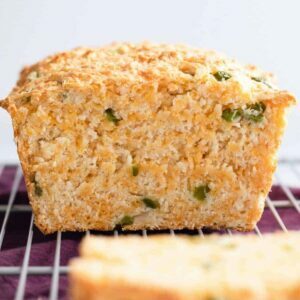 With a generous amount of sharp cheddar cheese and jalapenos, this bread will knock your socks off! It’s so flavorful and will be great alongside your favorite soups. Preheat the oven to 375ºF. Grease a 9x5-inch loaf pan. In a large bowl, combine the flour, sugar, baking powder, salt, and white pepper. Stir with a whisk. Add the cheese and jalapenos. Stir to combine. Whisk the buttermilk and butter together and add it to flour mixture. Stir until well combined. Pour the batter into the prepared loaf pan and spread it evenly with a rubber spatula. Bake for 45 to 50 minutes, or until a toothpick inserted in the center comes out with only a few dry crumbs. Cool in the pan for 5 minutes. Turn the bread out onto a wire rack and cool completely. Slice and serve. Would this bread do okay in the freezer? I like to do large batches of individual serving loaves of bread & then freeze them. Yes, you could freeze the bread for up to 3 months. About how thick do you cut the slices/how many slices do you get? I’m trying to calculate the calories of the entire loaf. Thank you! You should be able to get 8-10 slices from 1 loaf. I would love to make this recipe but I live in the UK where we use either imperial or metric measurements. I have tried to get accurate cup measurements from Google but all answers are different. Would it be possible to provide accurate amounts for the flour, buttermilk and butter please. Hi Gail! I’ve updated the recipe so you can make it too! I’m making mini loafs would I still bake at same temperature? Yes, I would keep the temperature the same and just reduce the amount of time in the oven. I would start checking them after 20 minutes. I’m so glad you enjoyed it! You can definitely add as many jalapenos as you like! I added sun dried tomatoes, capers and bacon bits along with the sharp cheddar cheese. It is an amazing recipe and could be used with many different variations. I love the sound of all those additions! I’ve not made this recipe with regular milk so I can’t say for sure how it will turn out. My fear is it won’t rise properly. My suggestion would be to make your own buttermilk by adding 1 and 1/2 tablespoons of lemon juice to the 1 and 1/2 cups of regular milk. You could also use sour cream or plain yogurt in place of the buttermilk. Made this today to go with a chicken & rice dish. What a Great bread, was easy to make and had a definite bite. Could eat the whole loaf myself with a bottle of wine, my kind of dinner. Sometimes the jalapenos can be too hot. Could I substitute with the small can of diced green chili’s instead? They are milder. I think that would work okay as long as you drain the chiles well before adding them to the batter. This sounds so delicious! I’m a huge fan of cornbread. Would it be possible to substitute cornmeal for a portion of the flour? Everything all together sounds uber yummy and I have lots of friends that would devour it. It’s certainly possible to do that. You can use 1 and 1/2 cups of cornmeal in place of 1 and 1/2 cups of all-purpose flour. I’m baking this bread now. I did 1.5x the recipe and everything worked out. The bread is tender, tangy and addicting. Good job on the recipe. What is white pepper? Can I use black instead? White pepper is simply the inner seed of the white peppercorn. It is spicier than black pepper. You can find it at most supermarkets in the spice aisle. Yes, you can use black pepper instead. I just made this “bread”. I say “bread”, only because the mixture is extremely thick like a biscuit and not a yeast dough, which I think is what most people are expecting. I did have to bake it a tad longer than the recipe called for. It just didn’t want to cook all the way thru. With all of that being said, it’s AMAZING! It taste soooo good! Who doesn’t love fresh, hot from the oven carbs! 😉 It’s so easy to make and much less intimidating than using yeast. Quick bread is certainly denser than yeast bread and every oven is different, so cooking time can vary. But all in all, I’m glad you enjoyed the recipe. Thank you for the feedback! Could this be made in a bread machine? I’ve honestly never used a bread machine and have zero knowledge about how they work. Because of this, I can’t say whether or not this bread can be made in one. I’m sorry. I wish I could be more helpful. Hi Jen. I made this Cheddar Jalapeno Buttermilk Bread New Year’s eve for out of town guests. Our daughter was married that following weekend and we hosted a New Year’s eve party for the out of town guests that were in Houston. We served the bread with BBQ and it was a huge hit. Didn’t change a thing in the recipe, it was perfect as is. Thank you so much for sharing! That’s so exciting to hear! Thank you so much for trying the recipe and leaving your feedback! Thank you for this recipe. I am making it tonight to go with a sausage and corn chowder. yum ! I’m making this right now and it looks really good. However, I’m worried that I messed up. My batter is really thick, i’m having to spoon it into my pan instead of pouring. Is it supposed to be this thick? I also had to add almost a tbsp of extra buttermilk just to be able to combine in all the flour. The batter should be fairly thick but easy to come together. It is possible you used too much flour. How did you measure it? Did you scoop it out with the measuring cup? Ooh, I love pretty much any cheese and jalapeno combination! I’ve never tried a buttermilk bread recipe but this looks and sounds amazing! wow this bread looks so delicious Jen, will go so well with a cup of hot soup! Mmmmm!! Thanks, Manali! It would be perfect with a cup of hot soup. You make me want to make another loaf!! Oh man, my husband is going to love you! I have been making a new bean chili and this would be the perfect side for it. I am going to try this recipe this week! It would go great with chili! Enjoy. Savory and a little heat? I love this bread!!! gorgeous! I’ve never tried buttermilk bread, but this one looks perfect! Love the texture! Love jalapenos, pinning to try it! Oh wow! I LOVE jalapeno bread!!! Whenever we visit the States we always order cornbreads and biscuits everywhere. I will definitely have to try this at home! The texture of this buttermilk bread is perfect, Jen! It looks so moist and flavorful! 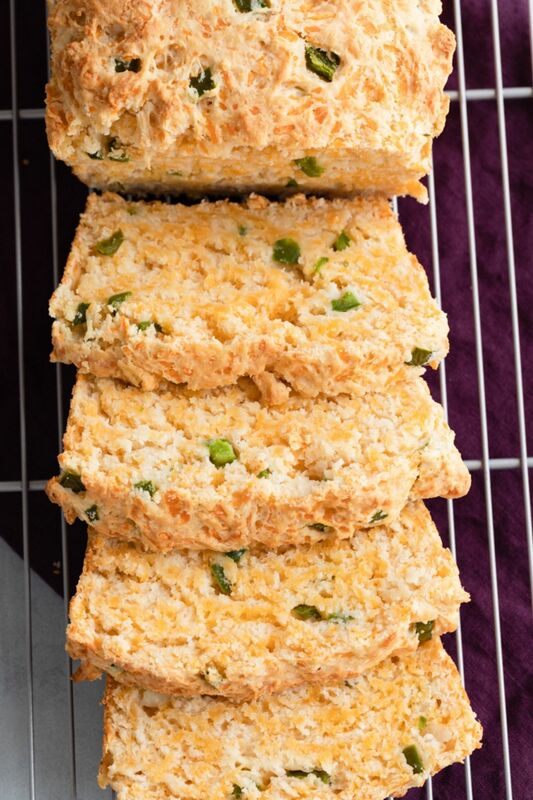 Cheddar and jalapeno are such an awesome combo and I love how easy this bread comes together! Thank you, Kelly! I never knew how great it was until now. Love the addition of buttermilk in the bread. Looks so perfect, mouth watering! Oh my Jen. I’m drooling! And this couldn’t have been better timing. My CSA just unloaded jalapeños on me. I canned almost 2 lbs this morning and am looking for other ways to enjoy them. This is perfect! The buttermilk tenderizes! Yaassssss!! Thank you for this. So looking forward to it! Wow, that’s a lot of jalapenos! Making bread with them is certainly a great way to use them up. Enjoy! I always tend to make sweet quick breads, but this one would definitely win over those anytime! I love cheddar cheese and jalapeño together, they sound perfect in this bread! I’ve never made a buttermilk bread before, so I definitely need to try this out! I’m loving this bread, Jen! Just the cheese in here is making my mouth water, so the addition of jalapeno sounds just perfect! It is definitely something you should try sometime. If you like cheese and jalapenos, you will love this recipe.